A fun-loving “designer dog” — and therefore a mixed dog breed — a Yorkipoo is a cross between the Yorkshire Terrier and a Toy or Miniature Poodle. Intelligent, affectionate, and gentle, he makes a delightful companion and is perfectly suited to apartment life, especially if you don’t mind the barking. He has plenty of energy to be burned off and he loves to play when he’s not parked on your lap watching the world go by. His ability to run fast and jump high can be surprising to those who aren’t expecting a canine Superman in miniature. See below for complete Yorkipoo characteristics! The Yorkipoo loves people and fun, not necessarily in that order. He will delight his family and is always willing to perform tricks or show off for any visitor. His confidence keeps him from being overly snappy or aggressive; he's happy in his own skin. The Yorkipoo can be an excellent companion to anyone looking for a small, confident dog with ample energy and even greater love. Like most of the Poodle hybrids, the Yorkipoo was originally designed to be a companion dog who could reside with allergy sufferers. The goal was a small dog who didn't have the diseases of either the Yorkshire Terrier or Poodle, both of whom have suffered from health problems related to poor breeding or overbreeding. Both breeds are intelligent, though, and so is the Yorkipoo. Both breeds enjoy performance competition, such as agility and obedience — and so does the Yorkipoo. The Yorkie is more independent than the Poodle, so a Yorkipoo's independence depends on the temperaments of the individual parents, the Poodle parent in particular. Yorkies don't necessarily need to be on your lap, whereas Toy and Miniature Poodles are practically barnacles; with the Yorkipoo it all depends, again, on the parents. The Yorkipoo has low-dander, a low-shedding coat, and the small size of a toy breed. He's happy in many different types of homes and can make an excellent companion for the elderly. 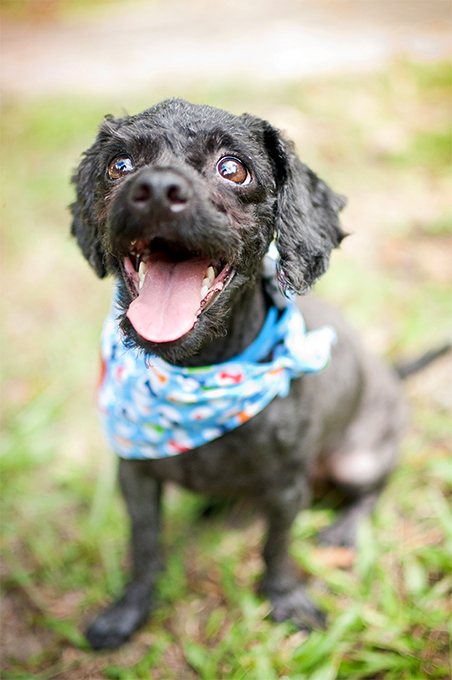 With his gentle and loving disposition, the Yorkipoo has proven that he can be a successful therapy dog. Unfortunately, some dogs who weigh less than 10 pounds are clueless about their physical size and have been known to launch themselves at big dogs, and the Yorkipoo falls into this category. To protect your Yorkipoo from himself, introduce him to large dogs under supervision, before they interact on their own, to prevent potentially disastrous consequences. Dog parks intended for all sizes of dogs are not suited to canines weighing less than 10 pounds as it's all too easy for them to be seen as prey, and for them to foolishly act aggressively toward a large dog. The Yorkipoo does well at training and is usually a quick learner. He can be stubborn, but this trait tends to rear its ugly head if training is harsh or becomes repetitive. Keep his lessons fun and interesting, and all should go easily. Consistent, positive reinforcement is the only way to train a Yorkipoo, especially since harsh corrections can seriously injure such a small dog. Even if injuries weren't a concern, negative reinforcement doesn't work with this dog because he'll simply shut down. The Yorkipoo enjoys barking just a little too much ("I love this and I'm good at it!") and generally makes an excellent watchdog. He'll alert bark when someone comes to the door or when he sees anything suspicious (and the chances are good he's got a different definition of suspicious than you do). Some Yorkipoos can be trained to only bark once or twice, but many cannot. There's a difference between an intentional breeding of carefully selected Yorkshire Terriers and Poodles versus a Poodle mix who's called a Yorkipoo because no one has any clue what his background really is. When the mix works as intended, you get the intelligence and spirit of the Poodle and the bold terrier aspects of the Yorkie. Of course, when the mix doesn't work, you can get a submissive, urinating fear-biter — but that can happen in any mixed breed, and in any purebred with unhappy genes. The Yorkipoo is a designer dog and is the result of Yorkshire Terrier to Toy or Miniature Poodle breedings. There's been an increase in multigenerational breeding (Yorkipoo to Yorkipoo), and also in Yorkipoo to Poodle or Yorkipoo to Yorkshire Terrier breeding; but many litters are first generation, the result of breeding two purebred parents. A Yorkipoo is active and energetic, as are both Poodles and Yorkies. He requires daily exercise and does well with a good walk or romp in the yard. Barking is a favorite pastime. Occasionally a Yorkipoo can be trained to bark less, but expect to hear the noise whenever someone comes to the door. He has no clue that his bark doesn't terrify anyone. He is a non- to low-shedder and can make an excellent companion for people with allergies. Daily brushing is needed to keep his fine, silky coat free of tangles and mats. Loving and gentle, the Yorkipoo can make an excellent companion to older, more considerate children. Like most toy breeds, he's not recommended for homes with very young children. He's easy to train if you use positive reinforcement. He's got a stubborn streak, though, so expect some occasional resistance. The Yorkipoo can live very happily in an apartment. He generally does well with other dogs and pets. A companion dog, he may suffer from separation anxiety when left alone for long periods at a time. Like many designer breeds, the Yorkipoo is quite a young hybrid — he's been popular for about a decade. He was originally developed to create a toy-sized dog who had a hypoallergenic coat and was free of the genetic disorders that affected the parent breeds, the Yorkshire Terrier and the Toy or Miniature Poodle. The success of crossing the Poodle with the Yorkshire Terrier has had mixed results, as with any hybrid; but the popularity of the Yorkipoo has grown. Today, most Yorkipoo litters are still the result of first-generation breeding, but some breeders have concentrated on multigenerational crosses in an effort to see the Yorkipoo produce offspring who confirm more consistently to the desired traits. 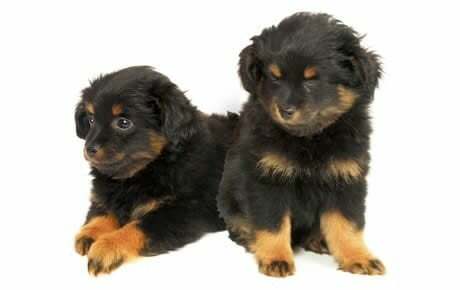 There are no breed groups or registries for the Yorkipoo, but efforts have begun to create a direction for all Yorkipoo breeders; these will soon be available at a pending site called www.yorkipoo.org. The Yorkipoo ranges from 7 to 15 inches in height and 3 to 14 pounds in weight. Size can differ between individuals, and the mature adult size is usually a reflection of the size of Poodle who was used for the crossbreeding. The Yorkipoo is an active, affectionate, fun-loving dog who relishes the company of people. He is loving and loyal, a true companion dog who enjoys participating in family activities. He's confident, thanks to his terrier heritage, but usually he's also easygoing and less demanding than many other small breeds. He's intelligent enough that, given consistent and positive training, he can be a perfect companion. He tends to be watchful and is happy looking at the world from the warmth of his owner's lap, but he also enjoys exploring new things on his own. Like every dog, the Yorkipoo needs early socialization — exposure to many different people, sights, sounds, and experiences — when they're young. Socialization helps ensure that your Yorkipoo puppy grows up to be a well-rounded dog. Yorkipoos are generally healthy, but like all breeds, they're prone to certain health conditions. Not all Yorkipoos will get any or all of these diseases, but it's important to be aware of them if you're considering this breed. In Yorkipoos, you should expect to see health clearances from the Orthopedic Foundation for Animals (OFA) for hip dysplasia (with a score of fair or better), elbow dysplasia, hypothyroidism, and von Willebrand's disease; from Auburn University for thrombopathia; and from the Canine Eye Registry Foundation (CERF) certifying that eyes are normal. You can confirm health clearances by checking the OFA web site (offa.org). Epilepsy: Epilepsy is a neurological condition that's often, but not always, inherited. It can cause mild or severe seizures that may show themselves as unusual behavior (such as running frantically as if being chased, staggering, or hiding) or even by falling down, limbs rigid, and losing consciousness. Seizures are frightening to watch, but the long-term prognosis for dogs with idiopathic epilepsy is generally very good. It's important to take your dog to the vet for proper diagnosis (especially since seizures can have other causes) and treatment. Portosystemic Shunt (PSS): This is an abnormal flow of blood between the liver and the body. That's a problem, because the liver is responsible for detoxifying the body, metabolizing nutrients, and eliminating drugs. Signs can include but are not limited to neurobehavioral abnormalities, lack of appetite, hypoglycemia (low blood sugar), intermittent gastrointestinal issues, urinary tract problems, drug intolerance, and stunted growth. Signs usually appear before two years of age. Corrective surgery can be helpful in long-term management, as can a special diet. Legg-Calve-Perthes Disease: This is a condition involving the hip joint. If your Yorkipoo has Legg-Perthes, the blood supply to the head of the femur (the large rear leg bone) is decreased, and the head of the femur that connects to the pelvis begins to disintegrate. The first symptoms, limping and atrophy of the leg muscle, usually occur when puppies are four to six months old. Surgery can correct the condition, usually resulting in a pain-free puppy. Hyperadrenocorticism: Also known as Addison's disease, this is an extremely serious condition. It's caused by an insufficient production of adrenal hormones by the adrenal gland. Most dogs with Addison's disease vomit, have a poor appetite, and have little energy. Because these signs are vague and can be mistaken for other conditions, it's easy to misdiagnose this disease until it reaches more advanced stages. More severe signs occur when a dog is stressed or when potassium levels become high enough to interfere with heart function, causing severe shock and death. If your vet suspects Addison's, a series of tests can confirm the diagnosis. Atopic Dermatitis: This is an inherited skin disease that manifests itself as a predisposition to develop allergic symptoms following repeated exposure to some otherwise harmless substance, typically an allergen such as dust mites or pollen. It usually shows up by the time the dog is about three years old. An atopic animal usually rubs, licks, chews, bites, or scratches at his feet, muzzle, ears, armpits, or groin. This irritation causes hair loss and redness and thickening of the skin. Treatment involves removing the allergen as much as possible, and administering antihistamines and steroids. Use hypoallergenic shampoos on affected dogs. The Yorkipoo is equally at home in a house or an apartment. He's far too small to live outside; he must live indoors for both his physical and emotional well-being. He requires daily exercise, since he has a surprising amount of energy (read between those lines). A daily walk or romp in the yard will provide enough exercise to keep him healthy and happy. The Yorkipoo can also burn off steam by playing a game of fetch down a hallway. Crate training benefits every dog and is a kind way to ensure that your Yorkipoo doesn't have accidents in the house or get into things he shouldn't. A crate is also a place where he can retreat for a nap. Crate training at a young age will help your Yorkipoo accept confinement if he ever needs to be boarded or hospitalized. Never stick your Yorkipoo in a crate all day long, however. It's not a jail, and he shouldn't spend more than a few hours at a time in it except when he's sleeping at night. Yorkipoos are people dogs, and they aren't meant to spend their lives locked up in a crate or kennel. Keep your Yorkipoo in good shape by measuring his food and feeding him twice a day rather than leaving food out all the time. If you're unsure whether he's overweight, give him the eye test and the hands-on test. For more on feeding your Yorkipoo, see our guidelines for buying the right food, feeding your puppy, and feeding your adult dog. The coat of the Yorkipoo can range from straight to curly, and it should be luxuriously soft and silky in texture — running your fingers through it is heavenly. Although it's different for every Yorkipoo, a puppy resulting from a multigenerational breeding (a Yorkipoo crossed with another Yorkipoo) is supposed to be odorless and nonshedding — although "nonshedding" is a fantasy, since every dog on the planet sheds at least a tiny bit. The Yorkipoo produces little dander, which is actually the trait that appeals to the allergic owner. The Yorkipoo is seen in a wide variety of colors, including cream, black, white, red, sable, apricot, tan, chocolate, gray, and silver. This versatile boy can sport multiple colors and a wide variety of markings, including black with tan points. Although he's considered to be a non- to low-shedder, the Yorkipoo requires care in keeping that fine coat silky and healthy. Brushing him daily wards off tangles. Brush the hair away from the eyes to prevent it from becoming an irritant, which it will certainly be if this task is neglected. You can also protect his eyes by trimming the hair with a pair of scissors. His coat should be trimmed regularly to whatever length you prefer; that's the beauty of a designer breed. No one is going to say you've clipped him incorrectly, because there is no "correct" cut. Bathing keeps his coat silky to the touch, but he only needs to be bathed when it's necessary, not on a schedule. Brush your Yorkipoo's teeth at least two or three times a week to remove tartar buildup and the bacteria that lurk inside it. Toy breeds are notorious for dental problems, as it's tough to get all those teeth into such a tiny mouth. Daily brushing is even better if you want to prevent gum disease and bad breath. Begin accustoming your Yorkipoo to being brushed and examined when he's a puppy. Handle his paws frequently — dogs are touchy about their feet — and look inside his mouth. Make grooming a positive experience filled with praise and rewards, and you'll lay the groundwork for easy veterinary exams and other handling when he's an adult. The Yorkipoo is a gentle and loving dog who can do well with children. He's not recommended for homes with very young children, since he can be easily injured when improperly handled. A Yorkipoo can make an excellent companion for an older, more considerate child. In general, he does well with other dogs and pets (not that there are a lot of pets much smaller than he is, but he doesn't grasp that). He may display prey drive due to his Yorkie parent, however. That may lead him to chase smaller pets and cats, but usually it's in good fun. Yorkipoos are often purchased without any clear understanding of what goes into owning one. There are many Yorkipoos in need of adoption and or fostering. There are a number of rescues that we have not listed. If you don't see a rescue listed for your area, contact the national breed club or a local breed club and they can point you toward a Yorkipoo rescue.